Today I decided to take on a big task of organizing our chaotic bathroom. 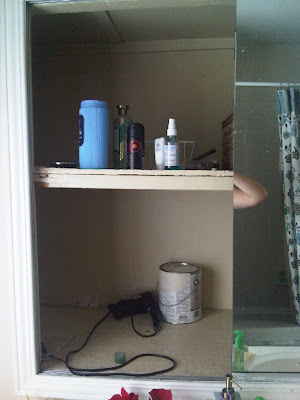 For those who have seen our bathroom you know that we have a ridiculous cabinet behind the mirror. 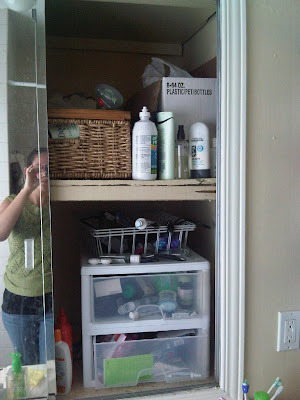 Now most people have storage shortages in their bathrooms. We have the opposite problem! Our cabinet is so ridiculously huge that I have never bothered organizing it because we have so much space. Just to visualize it here is our cabinet... and yes that is Ryan in it!! So here is what I started with today! See the 3 feet of space!! The biggest task was cleaning the cabinet. It hadn't been cleaned since before we moved into the house.. the only spot in the entire house that wasn't cleaned! SO I tackled that first with a cloth, soap and warm water. It didn't take too long! The cabinet is made out of chip board so it has a lot of sharp edges. 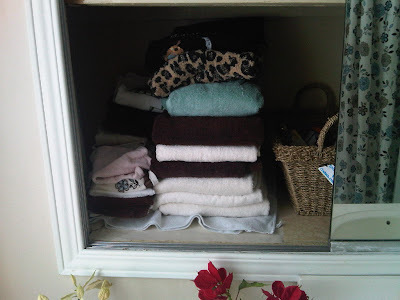 I didn't want our towels to get snagged so I found some shelf liner that we had lying around the house. And after cleaning the cabinet it was time to install the shelf liner. 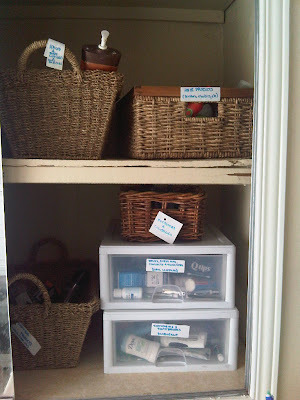 Then it was time to organize, my favourite thing in the world to do! We had a bunch of extra baskets around the house that I thought would work great to keep things organized. I labelled the baskets so Ryan can find things easily (I'm tired of hearing "Meghan where are the nail clippers!") haahaa!! SO after about 2 hours of work look at the wonderful organization!!! YEAH!!! SOO much better!! !